Goats are bovids, like cows, but generally smaller and better adapted to steep, mountainous areas. Their wild relatives—including Bezoars and Takins—still roam the planet today. Goats were first raised by humans 10,000 years ago. Today, more than 200 breeds provide milk, cheese, meat, hides, and fibers, and help carry heavy loads. Goats are browsing herbivores. They eat leaves, twigs, vines, and shrubs. Because goats have 4-part stomachs and ruminate, or chew their cud, they can digest plants other animals cannot. On farms, goats are typically fed cracked or ground corn mixed with oats, hay, and alfalfa. Goats live on every continent except Antarctica. The largest numbers of domestic goats live in Asia. Wherever they live, breeds have been adapted to the environment. Goats spend much of their time eating and chewing their cud. They are browsers, reaching up and around for food. In contrast, their sheep relatives eat plants on the ground. Because they offer so much and require relatively little care, goats are among the world’s most numerous domestic animals. Some specific breeds however are declining. And some wild relatives of goats, including the Takin (found on the Zoo’s Northern Trail), are threatened. Height: 18 inches - 3 ft. Weight: 40 - 200 lbs. Number of babies per pregnancy: 2 avg. A small herd of domestic goats lives at the Goat & Sheep Barn. When the Wells Fargo Family Farm is open, visitors can see kids (baby goats) playing and yearlings butting heads. 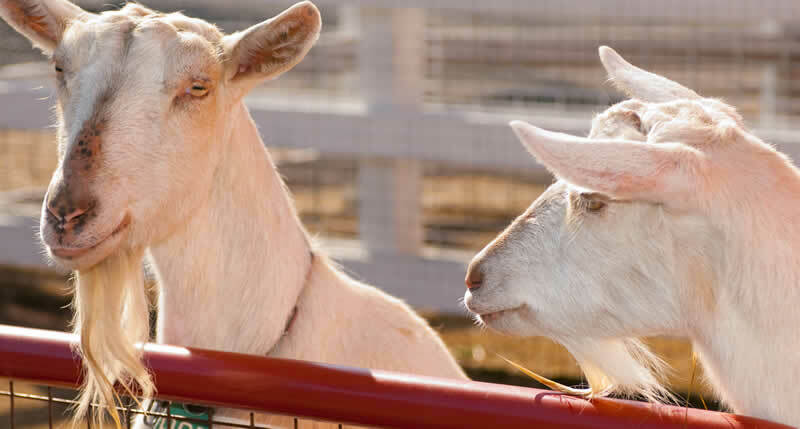 With the help of Zoo staff and volunteers, visitors can also feed, groom, and pet the goats. 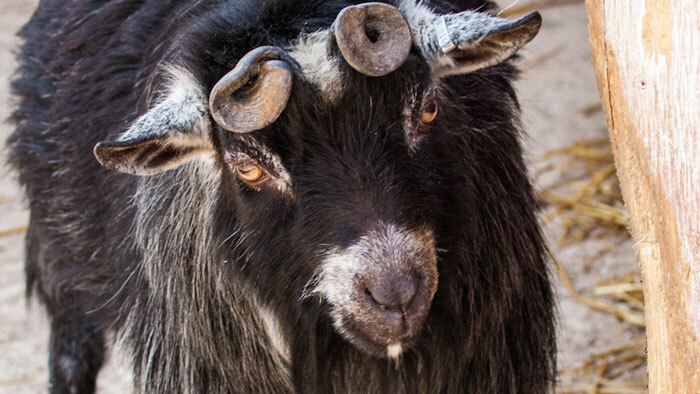 The Zoo’s herd includes French-Alpine goats of various colors, white Saanen goats, and smaller Pygmy goats. To see a wild relative of the domestic goat, circle around the Northern Trail, where the Takin is on exhibit—part of the Zoo’s commitment to helping rare and threatened animals survive. The Goat & Sheep Barn includes a fenced area for goats to enjoy the fresh air outdoors. Inside the barn, you’ll find a kidding pen for female goats and a separate lambing pen for ewes (female sheep). There is also a billy pen for male goats and a ram pen for male sheep. 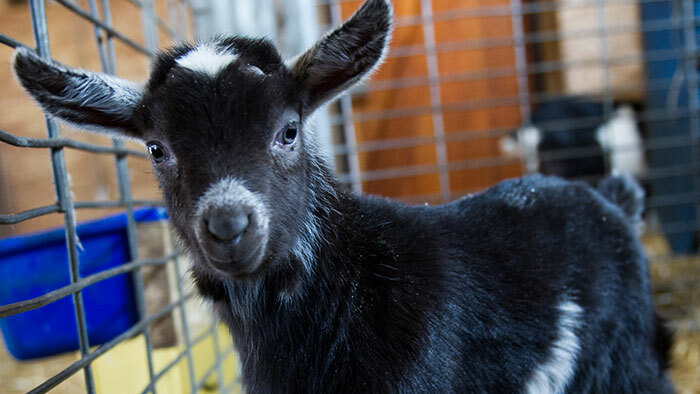 Goats at the Zoo are cared for from birth through breeding. If allowed, does (female goats) look for a safe place in the brush, far from predators, to hide their newborn kids. At the Zoo, however, does give birth in the kidding pen, where they and their babies will stay for the first few days. Kids weigh 6-10 pounds. at birth. They are most often born as twins, although single births, triplets, and quadruplets are not uncommon. Mothers first nurse their kids on a super-rich milk called colostrum. Colostrum contains antibodies kids need to be healthy. Kids unable to nurse on their own are bottle-fed by Zoo staff. Once kids are weaned, they are fed milk replacers and later switched to dry feed and water. Goats at the Zoo eat a diet of cracked or ground corn mixed with oats, hay, and grass. Male and female kids are generally housed separately from the age of 12-14 weeks until they are old enough for breeding. Does generally are ready for breeding between 6 months and 1 year, while bucks are ready at 3-10 months of age. Breeding occurs most often in late fall or early winter. Young are born in the spring. Gestation lasts about 5 months, or 148-156 days. Just before giving birth, a first-time mother grows udders, and those udders fill with milk. After giving birth, a doe can produce 3,000-5,000 pounds. of milk in a year. The Zoo’s dairy breeds—the French-Alpine and Saanen goats—are particularly strong milk producers. Not all goats born at the Zoo become part of the herd. Most are sold to market in the fall after weaning. Contrary to stories, goats do not eat tin cans. Even though they have 4-part stomachs and a taste for bitter plants, they prefer twigs to tin. Around the world, more people drink goat’s milk than drink cow’s milk—or the milk of any other single animal. Goats are prized for their ability to eat weeds, bushes, and vines, thus clearing land for farming. But that same talent gets goats into trouble. Left unchecked, goats can destroy groundcover and cause soil erosion. Historians believe domestic goats were aboard the Mayflower on its 1620 voyage bringing Pilgrims to North America.